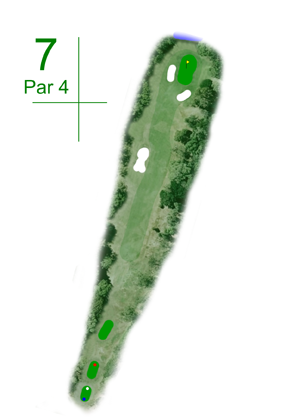 A short narrow par four that requires accuracy. The fairway narrows long off the tee and the fairway bunker comes into play. Smart play is to hit at and finish short of the fairway bunker leaving a clear shot to a green protected by bunkers and hazard left, right and back of the green. If a little nervous on the second shot you can lay up short of the centre of the green and have a simple chip on.